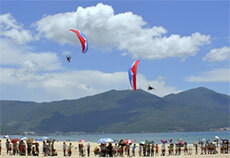 T he ‘Da Nang – Summer Destination 2013’ event was officially launched on June 28, featuring a wide range of cultural, sports and tourism activities to attract visitors during the summer holiday season. The annual tourism stimulus programme will run until July 3 and aims to promote Da Nang sea tourism and services and turn Da Nang into a tourism-event city. This year’s programme includes a variety of new and exciting activities such as parasailing, football art performances, skateboarding, roller-skating, and all-terrain bike riding, which will appeal to both local residents and visitors. On June 28, visitors enjoyed a special performance by the Sachoom art troupe from the Republic of Korea in Bien Dong Park. The programme is part of the activities to connect the tourism sectors of Da Nang, Hue and Quang Nam through promoting joint tours. The number of tourists visiting Da Nang since early this year was up 4% against the same period last year, and it is forecast to increase by 15-20% this summer.